I don’t know how Santa and his minions did it before the advent of the World Wide Web. With a belly full of Thanksgiving goodness, maybe he braved the possibility of pepper spray to fill his giant velvet bag full of the year’s best gifts. I am sure the reindeer would provide more than adequate entertainment as he queued up hours before a store’s opening just check off handfuls of “nice list” names. Not having the patience of a saint, Santa Claus or any other mythical being, I opted out of Black Friday madness, choosing to spend the wee-hours of it curled up with a biography of Mao Zedong’s personal physician and the daylight hours devouring Thanksgiving, round two, at Thad’s cousin’s home. While I was glad that I wasn’t trampled trying to buy low-priced electronics or crushed searching for Elmo’s most recent noise-making reincarnation, I soon realized that while my list was made, I’d checked it twice for those whom I deemed naughty and nice, that was as far as my planning had gone. In recent years, a fertility explosion has left Thad and I with eleven nieces and nephews, not to mention parents, siblings, in-laws and friends to expand my holiday shopping experience. Have no fear, the internet is here! Black Friday may be chaos and utterly overwhelming, but Cyber-Monday is right up my alley. While Xu Laoshi droned on about why Chinese characters look nicest when they fit in a perfect square, I planned my evening shopping spree. Once home, it didn’t take long for my slacks and blouse to be replaced by cozy penguin-covered fleece pajama pants and an oversized purple Raven’s t-shirt. Soon, with a throw-blanket over my legs, a computer on my lap and my debit card leaned neatly up against the screen, I was ready to help the economy grow! My Christmas shopping is by no means complete, but thanks to Al Gore and his expedient invention, the internet, I have a respectable start. Cyber-Monday was a success in the Ross mo-partment. I think now we are ready to move on to World Wide Web Wednesday and e-Friday! An array of international Santa Clauses, a giant, glowing evergreen tree, hoards of ice skaters bundled in puffy jackets, colorful scarves and a rainbow of beanies, and a cup of steaming, smooth hot chocolate all mean just one thing- Christmas is in the air! The Christmas season, in my little world, has a definite period of time in which it fits. (Thad calls it arbitrary, but it makes perfect sense to me.) Christmastime starts the day after Thanksgiving, although I did not partake in any pre-dawn shopping madness, and continues through the end of the year. Once the turkey is devoured, the mashed potatoes have been ingested and the yams have been lovingly crammed down the kitchen sink disposal, Christmas can officially commence. I love seeing the houses decorated in lights (although I can do without blow-up Snoopy and his cohorts in yard after yard), the malls and stores with wreaths hung and the familiar ringing of the Salvation Army bells. The all-Christmas-music-all-the-time station is officially the go-to radio station for the next four weeks. As we spent Thanksgiving weekend in Greensburg, Pennsylvania with Thad’s dad’s side of the family, we had a chance to go in to Pittsburgh on Saturday night to officially kick off Christmas merriment. After a great meal of hotpot at a rather authentic Chinese restaurant, we headed downtown where the city has an enormous Christmas tree lit and decorated, surrounded by an ice skating rink. The weather was great for a late November evening and we comfortably strolled through the masses awaiting their turn to take to the ice. Nearby, the windows of the office buildings were filled with gingerbread houses that local Girl Scout troops and school kids had created and built. An attached atrium housed another gigantic tree, surrounded by even more gingerbread creations. I think the rules of the contest allowed for any edible construction materials, as graham crackers seemed to be the foundation of choice, with everything from ice cream cones to Oreos being injected into the creative process. I do have to question the authenticity of several of the elaborate projects that assert to be from preschool-aged students, but are obviously creations of their helicopter-mothers and overly-involved, Boy Scout Troop leading fathers. With the Thanksgiving carb-fest completed, all it took was a little Christmas music, a chill in the air and some twinkling lights to make me giddy for the overdose of red and green, of penguins and reindeer, of elves and Mrs. Claus and of shopping and wrapping that will occupy my free time for the next few weeks. The Christmas season is here and I couldn’t be more thrilled! The time for a reprieve is over if you are a turkey. The rafters of turkeys have been culled. (Yes, rafter is the correct collective noun for turkeys. I checked.) Waddle-bearing heads have been severed from their skinny little bird necks and are now tucked neatly inside the gutted corpses of their previous owners, alongside a baggie containing said bird’s various and sundry innards. All of this is neatly wrapped in tight plastic covers and crammed into overflowing freezers across our great nation, along with bags of cranberries, and a variety of vegetables awaiting their day of glory. Soon kitchen cupboards will house piles of breadcrumbs, drying in preparation for their role as the much coveted stuffing. Shelves will be stacked with pie fixings and crusts, yams, rolls, green bean casserole parts, as well as the goodies that make up the dishes that are unique traditions for each family. The internet is filled with recipe websites, explaining down to the last detail how to make sure a Thanksgiving meal goes off without a hitch. As a fan of the starch filled goodness of Turkey Day, with years of practice participating in these annual feasts, I thought I could add my own recipe to the copious amount already floating through cyberspace. 5. Eat. Eat seconds. Against conventional wisdom, eat thirds. 6. “Help” with clean-up by putting a few things into Tupperware containers. Sneak out of the kitchen when everyone else isn’t looking. 7. Lay on the couch/floor/loveseat in a carb-coma. 8. Eat pie, even while your brain says yes and your tummy says no. 10. Cheerfully accept your annual advent calendar filled with adorable chocolate figures and a plate full of leftovers and head home, dreaming of the turkey sandwiches which will be lunch tomorrow. This year we will not be enjoying the abundance provided by several Thanksgiving dinners as we have in Idaho in years past, but our feast will not be without family. As of tonight, the mouth count for dinner with Thad’s family in Pennsylvania is seventeen. While the family members will be different, I imagine much of my recipe will still be followed. If nothing else, I know I am yet again assigned to bring rolls. Apparently, word of my cooking ability has reached Nanny, as not only were rolls allocated to me this year, but she also told Thad that it would be okay if I just stopped at the store and bought them! Good choice Nanny, good choice! But I digress. The sky is gray. Misty moisture hangs in the air. Groceries are to be delivered soon. All of this together makes me think of those picture books- namely The City Mouse and the Country Mouse. The basic premise of this classic tale is that these mice switch places, the city one going to the countryside and the country mouse going to the big city. While on their little vacations, each mouse discovers that he is best suited for the environment from which he came, although they do each embrace a bit of adventure along the way. The rodent-riddled story comes to mind today not because I mouse-ily wish to retreat to my former surroundings, but because as I sit here awaiting the arrival of my milk and eggs and bread, it is the perfect time to ponder the many ways that city life in the DC Metro area is different from the more suburban one I had living in the Treasure Valley. *Public transportation is the way to roll. In the last six months I have ridden a significant portion of the DC Metro lines. I’ve spent countless hours on the blue line shuttling into the District and back, enjoyed numerous monument-filled crossings of the Potomac on the yellow line and ventured into Maryland several times on the red. Professional sporting events have led me to brave both the green line and the far reaches of the blue, while the lure of tasty food has sent me trekking up the orange line. While possibly a nightmare for the colorblind, the rainbow-hued map of the Metro system has served me well for the last half year. *Grocery shopping is done online and the bags of food are delivered directly to my front door. There is no more squeaky, wiggle-wheeled cart to push up and down the aisles of my nearby Albertson’s store, no more Sunday night runs to get sandwich fixings for the upcoming school week and no more dropping by the store on the way home from work to get a forgotten ingredient or two for that night’s dinner. Online grocery shopping may take a bit more planning, but it also means I can take care of my grocery list make-up-less and in my pajamas. (Okay, to be fair, if you grocery shop at Walmart, there are many a customer there who are shopping in a state that makes them appear as if they just rolled out of bed, but I can do so with dignity in the privacy of my own little home!!) Not only is shopping done in the cozy comfort of the mo-partment, but the scheduled delivery means that Thad’s copious amounts of Diet Mountain Dew magically appear at my door without me having to haul them myself. *Our knowledge of local car rental companies is quickly expanding. Without a car, but living in a place where there are no less than a million historical sites to be visited, long weekends require personal transportation. Since we are on the east coast for a limited amount of time, we try to take advantage of every opportunity to visit the parks and monuments in the area. This means that the Enterprise and Hertz websites and I have become very comfortable with one another. I can reserve the best deal, with discounts added, in a matter of minutes without having the search endlessly for just the right ride. Thad has become buddies with the manager of one nearby rental company, always stopping to chat with him before embarking on the circle of safety required before the car keys are handed over. The transition from Idaho life to Virginia life isn’t nearly as dramatic as the ones faced by the country mouse and the city mouse, but the idea that such a change requires a one to develop a different set of coping skills still holds true. In Idaho, I probably would have scoffed at someone telling me that they had their groceries delivered, but living on the ninth floor of an apartment building without access to a car, such a proposition suddenly makes a bit more sense. I can only imagine what this American mouse will be blogging about in six more months when Chinese mouse’s world becomes her own! Today’s destination? North to the sweet land of candy that is the headquarters of the largest candy company in North America-Chocolate World in Hershey, Pennsylvania. The home of cacao confectionery is just a few hours from DC and sounded like the perfect foil to Justin’s week of Smithsonian and national monument touring. When this plan was concocted earlier this week, we were all excited by the possibility of a bit of chocolate coming our way. We heard great things about the destination from a variety of friends. We formed mental images of a tasty chocolate land. What we found was great. It was tasty. It was also nothing that we expected. Chocolate World was a bit like the American version of Singapore’s Haw Par Villa. Craziness bottled as family-fun. 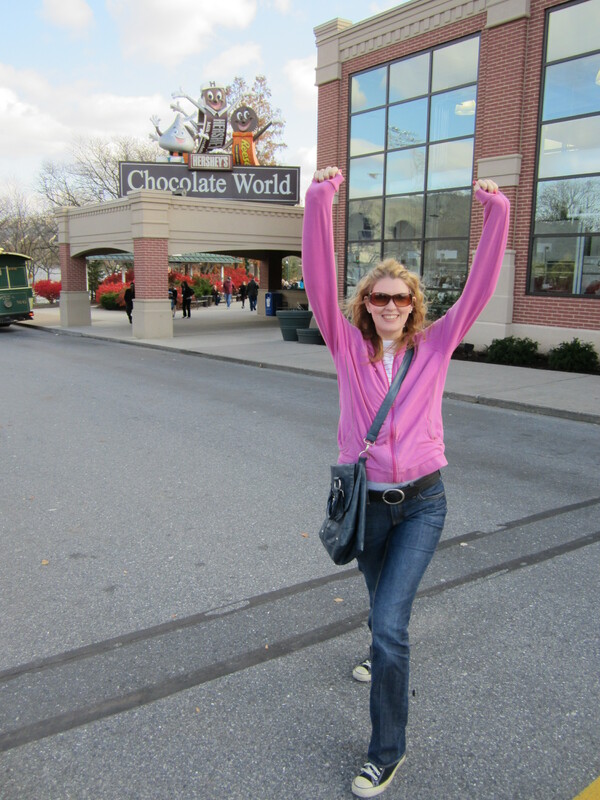 Once inside the awesomeness that is Chocolate World, we promptly enrolled ourselves in Hershey University. We mentally inserted our plastic pocket protectors and took our seats in the second row of a chocolate tasting class. The coursework was rigorous, including such tasks as listening to our various chocolate bars and blowing bubbles in our chocolate milk. It wasn’t easy and a few crib notes were necessary, but eventually all three of us earned our Hershey University Master’s degrees! This will definitely be added to my resume, as I am sure it will give me that extra leverage I might need to get a job within the Chengdu consulate. In Chocolate World, we were definitely part of the 99%, having racked up student loans and it seemed like it was probably time to put those college degrees to work by making chocolate bars. Our new uniforms included aprons, hairnets, gloves for me and a beard-net for Justin. We then entered the chocolate laboratory where we each got to choose a base chocolate bar (mine was dark), up to three inclusions (I went with almonds and raspberries) and a choice of whether or not to top it with sprinkles (like there is even a question there- yes please!). While our individual creations cooled, we then went off to the marketing room where we created labels for our new candy items. Finally, with the chocolate ready to go and the wrappers printed, we were handed our unique sweet treats! Thirty minutes of work on the chocolate factory line was more than enough for us, so with our personalized confectionery in tow, it was off to take a tour of the chocolate museum. Much like with the 3-D show, this was anything but what we expected! After loading into amusement-park like carts, we were hauled off on an adventure that included singing cows, a rather warm ride through a cacao bean roaster and images of thousands of chocolate Kisses being created. Just a day ago, I would have doubted anyone who told me there was such a thing as too much chocolate. No longer. As the name implies, Chocolate World is inundated with chocolate. We were given free samples at every turn. Like kids in a candy store, we all excitedly accepted each candy offered to us by these strangers (seeing no creepy white van in sight, we figured it was safe), not thinking far enough ahead to consider the possibility of a need for moderation. Soon the giggles of glee at each new proffering turned into stammers of soreness as our bellies ached from the over-consumption of these tasty gifts. Feeling diabetes swiftly inching closer and closer, we figured it was time to make our escape from the marvelous land that is Chocolate World. We went into this experience with high hopes, but the reality far exceeded those expectations. Hershey’s Chocolate World is Charlie Bucket’s reality transformed into our own, smack in the middle of Pennsylvania. It was definitely Golden Ticket worthy! Since the stores are quickly filling with elf-laden Christmas goods, my mailbox is daily inundated with gadget-packed catalogs and red and white striped candy canes have replaced the bags of fun-sized Halloween candy bars, the time to consider airline tickets home has come. Probably six weeks ago, Thad and I started to talk about what time he would have off around the holidays and mentally planning our trip home to Idaho. At that time, I checked ticket prices and was pleasantly surprised to see flight prices for the week surrounding Christmas at nearly the same price as they were when I flew home this summer. Without knowing for sure which days he would be able to take off from his Chinese studies, we shelved ticket-buying until more concrete information was available. About two weeks ago, FSI finally sent out a notice about the holiday schedule. Basically, students were told that they did not have to come to the facility each day for classes during the week between Christmas and New Year’s, but they were to create self-study plans and stick to them. On my first day of class this last week, the head of the Chinese department told us he didn’t care if we completed our self-study in our Oakwoods or on a cruise ship to Tahiti, as long as they were done. The combined presence of holiday bedecked stores and a set travel window sent me scampering to the internet to book those tickets I saw weeks ago. Alas, it was not to be that easy or painless. I was shocked and horrified by what I found in the vast cosmos of the World Wide Web. In the last few weeks, ticket prices from Washington to Boise have nearly doubled. Over the course of about ten days, I checked every possible ticket site. I dizzily circled Orbitz. My time logged on Expedia was anything but expedient. I Kayak-ed until my arms could no longer fight the white water of airline frustration. I was thwarted at every turn as I tried to finesse dates, create wiggle room in times and expanded my search to airports that weren’t just a single Metro stop away. Each of these maneuvers got me no closer to a bottom line that came anywhere near acceptable. After announcing that I no longer cared and we were just going to celebrate Christmas in the mo-partmet, China-style, I clapped shut the laptop and huffed off to bed in my pink, fuzzy monster slippers. I officially tagged myself out of this fight. Imagine my surprise when the following day, as I purposefully avoided looking at airline ticket websites, I received a text from Thad saying he had the answer to all of our Christmas woes. The short story is that he had a classmate who won tickets through a drawing with a not to be named airline. This fellow Chinese studier and his family were going to be unable to use said tickets and he was willing to give those tickets to us. It just so happened that a few days after he gave Thad the tickets, Thad gave him a nice monetary gift, just for being such a wonderful student of Mandarin. Our tickets are taken care of and I have spoken with my Nampa-based hotel concierge (she is nearing her third birthday and has a chocolate Hershey’s kiss and a room ready for me). It is now time to start gift shopping, which means another, more enjoyable, foray into the Never-Neverland of dot coms. The arrival of weekend meant books being shelved and the commencement of fun. (Okay, that isn’t entirely accurate. Rather than putting the books away, like the uber-organizational nerd that I tend to be, I wanted to get my stuff put together before the second week of classes began. Part of this process included taking my textbooks to Kinkos to have them re-bound. Rather than the regular, tight glue binding that they came with, I wanted them cut apart and put into spiral bindings. This is so much better for filling in page after page in my workbook!) The fun part is accurate though. Since Six Flags won out in a battle for weekend amusement a few weeks ago, this weekend went to the consultation prize- Theodore Roosevelt Memorial Island (hereafter known as TRMI). While it may have been the runner up in a fight between roller coasters and monuments, TRMI came in at the top of the list for great sight-seeing in the fall. First on the list for Sunday was a quick jaunt up the road from the Rosslyn Metro to pho. It just isn’t weekend here without a bowl of pho and a Coke (or Vietnamese iced coffee if you are Thad.) While the meat options include tripe and tendon, I stick with the brisket and flank. Thad uncomplainingly eats anything there as long as he can smother it in Sriracha sauce first. With our full bellies sloshing with pho broth, walking off lunch sounded like a good plan. TRMI is only about a mile from where we were at, so out we headed. Early November is a beautiful time to visit the memorial. Sunday was sunny without a cloud in the sky, so it was perfect day for our visit. The trees are currently showcasing their fall collection, making the crisscrossing paths into runways fit for New York Fashion Week. The piles of leaves covering the pathways lent themselves well to a little “Party Rock Anthem” action, as I found myself “shufflin’, shufflin’, shufflin’” through their crispy, crunchy heaps. While I didn’t strap myself to a piece of metal that shoots its occupants from zero to sixty in a matter of seconds like I did at the last park I visited, this park had a different set of thrills with the rainbow colored leaves slowly drifting down from the trees as we meandered our way across the island. Our visit to TRMI was a great way to welcome the crispness of fall during our year in DC!